Let's Talk Picture Books: THE ROOSTER WHO WOULD NOT BE QUIET! La Paz is a happy, if not super noisy village, so the townspeople decide to elect the super bossy Don Pepe as their mayor. Things quickly start to get quieter, much to the townspeople's delight, but it doesn't take long for things to get out of hand. Before they know it, even singing is outlawed and teakettles are too afraid to whistle. Only a local rooster seems not to care about the town's new rules, singing his loud "Kee-kee-ree-KEE! "s for all the town to hear. But despite their initial resolve to have a silent town, the people slowly begin to comprehend the situation they're in, and the rooster becomes a martyr of sorts: the more he gets in trouble with the mayor, the more the people rally behind him for their everyday liberties. The illustrations in this book, needless to say, are noisy. Yelchin mixed an assortment of media to create his spreads, using everything from oil pastels and colored pencils to gouache and acrylic. 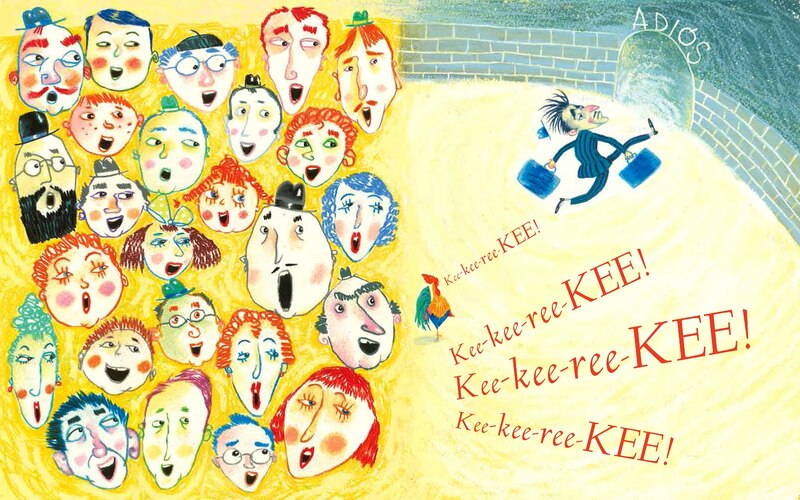 However, this seemingly haphazard array of media reflects the tone of the book pretty well: it's clear that the city is in chaos before Don Pepe arrives (and after he leaves) because we can see that chaos in the illustrations. Objects cover each other and colors blend together with seemingly no regard for color or texture borders. But between Don Pepe's arrival and departure, readers witness calmer scenes where colors are relegated to specific places on a page, or textures never overlap. The images reflect the tone of the text because they go through the same events as the townspeople. 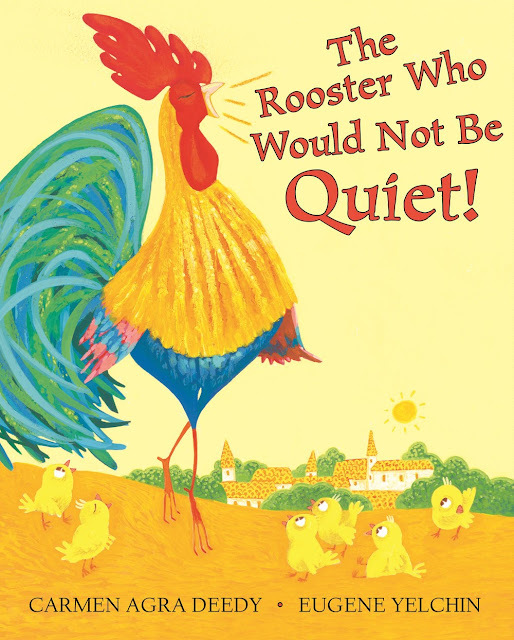 The Rooster Who Would Not Be Quiet! published from Scholastic Press last year! 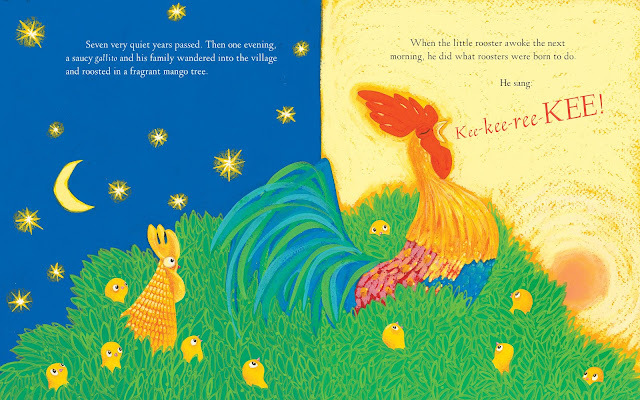 Illustrations from The Rooster Who Would Not Be Quiet! written by Carmen Agra Deedy, © 2017 by Eugene Yelchin. Used with permission from Scholastic Press/Scholastic.